Incidentally I've driven a rental Kia and currently have a rental Hyundai for work... amazing how much is shared from the display, buttons, camera, etc. I think Atlantica is the good bye model. I figured that this was only going to be the one gen when it was obvious I was the only customer who paid cash for it new (2.0) at my local dealer for the whole year. They where like congrats you gamed the system lol. 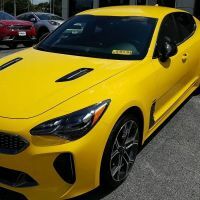 I saw on some car numbers websites that the stinger beat the K900 and cadenza in sales enough where that should end up being the flagship model based on numbers. So if it was a regional brand they would probably stop selling the K900 and cadenza in the USA and just stinger. But because their global and the new K900 was just rolled out looking bland, I suspect the stinger is done. 3. But they won't because the new k900 which would be the G90 for Kia was designed to be bland following the stinger vs being a longer stinger. 5. It's too bad they don't adapt the stinger design and go even further and replace their sedans with fastbacks. People want suvs because of the hatch and it would be pioneering to be the first to do so. I'm kinda hoping for a GT-R spec.. don't know if that's trademarked or nething.. but a factory 550hp modle would definitely spark my interest. �Whether there will be a replacement is too early to say,� said Guilliame. It's fake news.. the article is trying to cast aspersions on the Stinger.. the jackass who wrote it probably has a 2007 M5 in his driveway that he can barely keep on the road but he keeps it because he's a goddamn badge snob. There's nothing that Whichcar said that's inaccurate but even they pull the 'uncertain future' crap. That's true with ANY new model from a manufacturer. If it's not well-received it doesn't get a second generation. But here's the deal: It's anecdotal, sure.. but I see the Stinger all over the damn place here in Washington. If you ask me, for the price point it's WAY more successful than even KIA thought it would be for a first year model. It's just a matter of waiting it out a bit longer to see how sales progress.